I’m a fan of the phrase “it gets easier” when it comes to talking to moms with infants and toddlers. Those years are really in the trenches because even they are full of SO many joyful and beautiful moments, they are accompanied by many sleepless nights, blow out diapers, sporadic meltdowns, and other instances that are physically demanding. In that regard, it does get easier! However, whenever I say that, I tend to get push back from moms with older kids saying that they’d love to go back to those early years when the struggles were more simple and contained. I understand that too. I still have young kids myself, ages 6 and 3, so in this brief stage, I have the unique ability to view things on sides of the fence. Now that Hailey is 6 (and half), things are pretty smooth sailing on the day to day front. She’s a wonderful little person that I can reason with, give direction to, and- oh!- she can use the restroom all by herself. However, I’m seeing the other, more complicated, parenting trials starting to pop up. These challenges are more layered and emotional. Suddenly I’m having to consider things like how to help guide her through moments of hurt, feelings of inadequacy, and other situations that feel too grown up for us to already be flirting with- yet here we are. 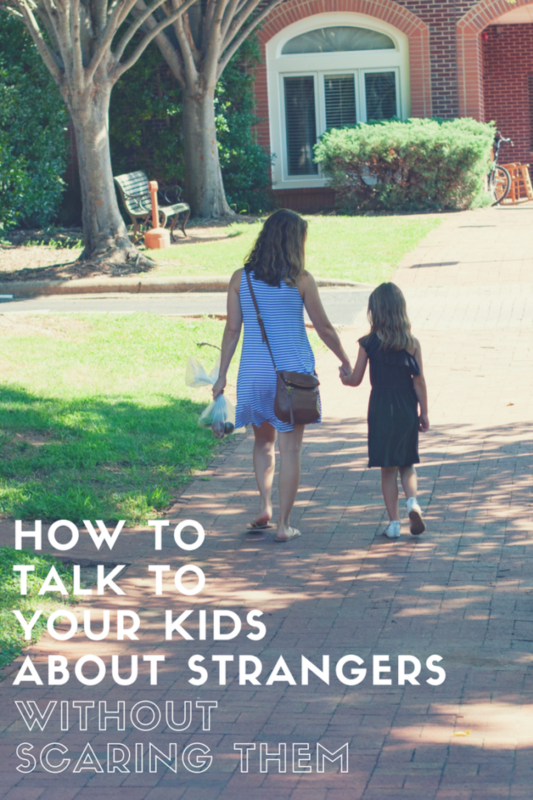 One of those realities I’ve been mulling over lately is how to talk to our girls about interacting with strangers. We are out and about quite often. David and I strongly encourage our children to develop confidence in the world and with people by doing things themselves. Most of these things I’m able to completely monitor (like when I have Hailey check out at the grocery store by herself), but I know there will be moments down the line when I’m not there to make the call on whether a situation is benign or not. I don’t want them to be afraid of strangers, but of course I don’t want them to blindly trust them either. So what’s a parent to do? We’ve taken the approach of teaching our children to trust their intuition rather than a blind wariness of all strangers. We chose to go this route after I considered how I handle stranger situations myself. The majority of the time it’s just good ‘ol neighborly chats and niceties. However, there have been instances of conversations or interactions when things just don’t feel right and when I know I need to get out of the situation quickly. I’m hoping to teach the girls to have the same trust in their gut reaction. To try and translate the idea of listening to your instincts, we’ve dubbed it the “uh-oh” feeling. I’ve been encouraging her to understand the uh-oh feeling by applying the same concept to different situations. An easy to understand example is when she does something she knows David and I won’t approve of. She is able to grasp that gut reaction of “Uh-oh, I know this isn’t the right thing to do” so we talk about how that is her intuition talking- the uh-oh feeling. We are going this route because I want her to be able to distinguish between being afraid of all strangers and being wary of strange people or situations. I want her to be comfortable being friendly while also staying aware. This is important to me because as a friendly person myself who sometimes struggle with people pleasing, I’ve been in uncomfortable situations when I should have said something or left, but didn’t do so because I didn’t want to be rude. Hailey really loves people, all people, but we had a moment once when she whispered in my ear- “that man is scary.” I was immediately tempted to push politeness and say “nooo, I’m sure he’s a very nice man!” But by doing that, I would have been shutting down her intuition. Instead, I just whispered back, “if he makes you feel uncomfortable, you can stand on the other side of me” which honored her “uh-oh” feeling. I love this! Great approach. Good points! As this is something I have been struggling with as well! Basically adults don’t ask kids for certain things- like help. If an adult needs help they ask another adult, not a kid. I look at it as part of a larger parenting picture as my goal with both our kids is critical thinking so this is an extension of that when dealing with strangers and even those that you might know but feel uncomfortable with! LOVE the tip that adults don’t ask kids for help. What a great point. Also, it’s so funny that you mention that book because my friend text me this morning after she read the post to tell me about that book too. I definitely have to check it out. Thank you! I was going to comment the same thing—adults don’t ask kids for help. This is something I’ve talked to my 6- and 4-year-olds about and I think it is a simple but effective guideline to help them determine what is appropriate stranger interaction and what isn’t. What a nice article as you demonstrate well the evolving child and parental teachings needed for this stage. Assisting a child to be confident and independent, yet aware and cautious when the uh-oh signal goes off, is an important parental responsibility. Thanks for raising awareness to this. John J. recently posted..What Are You Leaving Behind Upon Your Passing? Your girls are slightly ahead of our children in age and I always appreciate/resonate with your approach to parenting topics. Thank you! You write so beautifully and get to the heart of BIG parenting stuff without overcomplicating. I think about this stuff with my gregarious hyper social 3.5yo and with my equally un-shy 14mo. 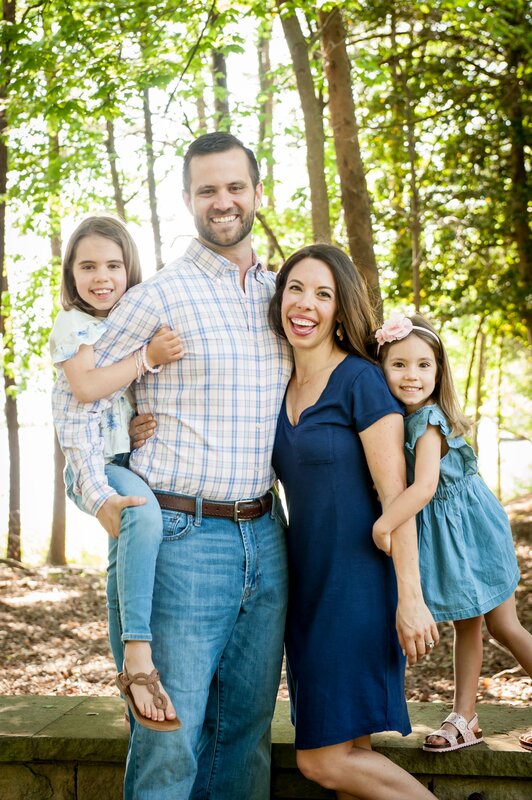 Raising girls adds another layer of trusting your intuition as I learned the hard way over and over and over again in unfortunate social and professional settings for decades. I love the phrasing of ‘uh-oh’ feelings. I’m also cognizant of my girls reactions to strangers who look different and may cause an uncomfortable feeling for other reasons. We live in a fairly white homogeneous State and I’m trying my hardest to ensure that zero racist/different/other feelings become intersectional when they are working their way through the world outside of our town and see more human diversity. We have a best buddy with only one arm, and she asked him once but thats never been something she sees as different. Well said! This is something I have been thinking a lot about lately. I, myself, am a very guarded person and I’m weary of most people (or strangers). But recently, I have been more friendly and using my gut instinct with certain people and situations, which has been serving me well. I will definitely reference this post once the time comes to talk to my boys about strange people. I really like the “uh-oh” feeling recommendation! I’ve struggled properly explaining the concept of strangers with my 4 year old, or rather “bad” strangers. A stranger would be anyone unfamiliar, and most strangers are good, but explaining how to know the bad strangers is something I’ve struggled with. I hesitated to give any physical descriptions of bad strangers, but the feeling that something is not right or scary is exactly it. And it is also helpful for me to think back on times when I’ve felt things were not right. We do a lot of hiking and before kids I hiked and went trail running a lot on my own. These are the times when my awareness has been most heightened and I’ve definitely had the feeling before of a person who seemed out of place or in some sense “up to something not good”. I think that was really powerful when you refrained from interfering with Hailey’s sense of “scary”. I’ve seen my own son run back to me on a trail if he gets a few steps ahead, usually because of a stranger coming from the opposite direction. At this point most any stranger seems to alarm him, but I’m confident as he gets older he will start to learn to use his intuition more for making bad versus good stranger situations. I would like to add that it is important to also address feeling uncomfortable with people the kids know, and possibly know very well. No matter how much Dateline or the evening news highlight stranger danger and random kidnapping, it is statistically more likely for kids to be harmed by people they know in a variety of contexts like school, worship, neighbors, relatives, care providers, etc. We need to educate our kids about those situations as well. Yes yes yes! I love that you brought this up because that’s exactly why I love the uh-oh feeling because it spans across so many different situations, especially when involving people in authoritative positions. Thanks so much for your comment! Reading this post I realize this is something I haven’t thought too much about so I’m glad you brought it up – I like the idea of the “uh-oh feeling”. The book Allison posted looks interesting. She also brought up a good point about people you know giving you that uh-oh feeling. This is important because so often bad things happen to kids from someone they know. I hate even writing that, but it’s true… We’ve taught our kids that they don’t have to hug or kiss anyone (relatives, friends) if they don’t want to. It’s their body and they are allowed to decide who they hug and kiss. Sometimes it’s me! And I’m OK with that. Yes to that! So important to teach kids that we will respect their boundaries when it comes to their own bodies, so that they will learn to respect others and their boundaries as adults! I think about this a lot as a mom raising two boys. This is very useful! Love posts like this! Thanks so much for this! I really do love hearing about your parenting techniques because I feel like we are on the same page on a lot of topics and ideas 🙂 My daughter is 2 and I’m already getting nervous about her growing up and how to approach areas this. I am definitely saving this post for when she gets a little bit older. We are just starting to talk about feelings now. I love that you pointed out not saying, “Oh! I’m sure he’s a nice man!” I feel like I might do the same without thinking about it (especially if I don’t have the “uh-oh feeling”) rather than honoring that and providing an alternative. Good reminder! I love this. They really pushed stranger danger on us and I’m pretty sure it’s one of the reasons I have such bad social skills, lol. Looking back, it’s really scary the things they said and made us watch when in reality, kids are so much more likely to be hurt by someone they know. My husband and I had this talk the other day about how we wish we could watch our kids interact with strangers without them knowing. We have a 4 and 6yo and it’s hard to encourage them to be polite and look at people in the eye, but also be very careful. My husband threw out the idea of having one of our adult friends (whom my kids do not know) meet my kids out in a situation and try to either lure them with candy or say “I”m a friend of your parents, come with me,” just to test my kids’ responses in a controlled setting. I go back and forth on whether I think this would scare them to be a good thing or for if it happens in real life, for them to say, “oh this might be mom and dad playing a trick on me again.” Any thoughts? One thing I love about reading this blog (and you!) is that you have definitely been given wisdom and pass it along freely. I have been trying to figure out how to effectively teach my very friendly children this concept, and I think you’ve hit the nail on the head! Thank you!! I was just wondering the other day how am I going to teach my now three year old about strangers without making him afraid of them. This couldn’t have been more perfect timing, granted I don’t feel the need to talk to him yet but I will keep this approach in my back pocket! I love your response to Hailey when she was uncomfortable, it was great! Thank you for this!